The most common indications for performing a heminephrectomy in a horseshoe kidney are a renal mass and a nonfunctioning moiety, which is usually secondary to a ureteropelvic junction obstruction. bIncludes additional patients with anomalous kidneys undergoing laparoscopic nephrectomy. Abbreviation: CTA, computed tomography angiogram. Most reports of laparoscopic heminephrectomy in horseshoe kidneys have been for a nonfunctioning and hydronephrotic renal moiety (Table 1) (20,24-28). There is one report of a heminephrectomy for a 3.5-cm renal cell carcinoma (22) and another report of a partial nephrectomy for a patient with a 2-cm cystic renal mass (21). When performing an extirpative surgery on a horseshoe kidney, there is no consensus on whether a preoperative angiogram is required or if a ureteral stent should be placed to help identify the ureter during the laparoscopic dissection. Several authors argue that for nonfunctioning kidneys an angiogram is not necessary (20,24,25,27,28). The renal parenchyma is atrophic and the blood supply is minimal. They argue that the magnification provided by laparoscopy makes identification of the vascular supply straightforward. If the surgery is performed retroperitoneally, care should be taken to avoid inadvertently opening the thin parietal peritoneum covering the ventral surface of the kidney. Molina and Gill state that when performing a partial nephrectomy in a horseshoe kidney, they prefer a retroperitoneal approach for posterior tumors and a transperitoneal approach for anterior tumors (21). The reported operative times for both retroperitoneal and transperitoneal approaches are approximately 200 to 300 minutes (21,22,25,28). A variety of techniques have been described for dividing the isthmus (Table 1). When performing a heminephrectomy for a hydronephrotic, nonfunctioning moiety, the isthmus can be divided extracorporeally (20,25). A port is placed at the level of the umbilicus, contralateral to the affected side and just off the midline. After the ureter is clipped and the collecting system is decompressed, the port site is extended to approximately 4 cm. The collecting system is then pulled out of the abdomen through the 4-cm incision. 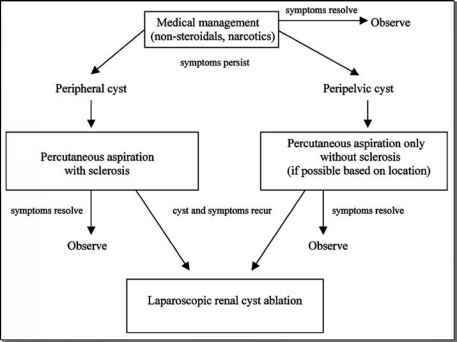 Traction is applied extracorporeally as the kidney is mobilized laparoscopically and the blood supply is ligated. The kidney is mobilized to allow the isthmus to be pulled out of the abdomen and be divided extracorporeally. Molina and Gill make the point that when planning for a partial nephrectomy, a computed tomography scan with three-dimensional volume rendering or an angiogram is crucial (21). A complete understanding of the arterial and venous supply is necessary to achieve vascular control. Molina and Gill report placing an open ended ureteral catheter and injecting dilute methylene blue dye to help identify entry into the collecting system. After repairing the collecting system with 2-0 Vicryl, hemostasis was achieved using a surgical bolster and 0 Vicryl sutures on a CTX needle. The warm ischemia time was 31 minute. The estimated blood loss was 100 mL and the total operative time was 3.3 hours.